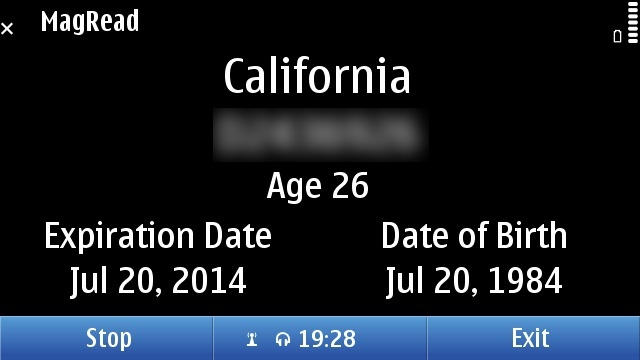 Late is a real-time public transit application for the Nokia N9 and N950 Harmattan phones. 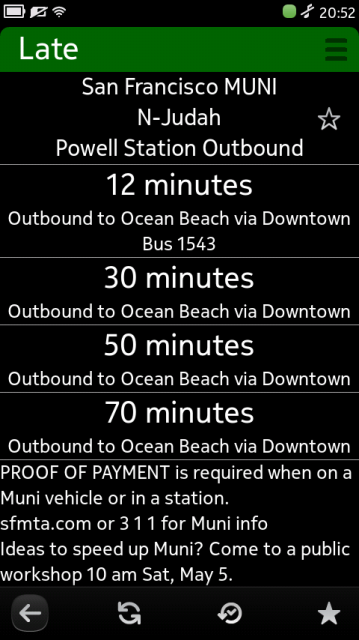 It works with any transit agency that uses NextBus and provides public access to their information. When starting the application, a view similar to above is shown. You can select Agency, Route, Destination and Stop to change them. Each item will provide a list that is relative to the list entry above it, and will allow quick navigation. The top of the application has two buttons which are always visible. Pressing the title, “Late”, will always return you to the home screen. The three vertical dashes on the right side of the titlebar is a menu button. The menu will provide basic navigation and additional version information about the application. The “About Page” will also include a button to remove all content Late has cached on the phone. The bottom shows a toolbar that provides quick navigation to most features in the application. The left button, an arrow pointing left, will return to the previous page or quit the application if already on the homescreen. The circular arrows button will refresh the currently shown prediction, or if on the homescreen, will load a prediction for the currently shown Agency/Route/Destination/Stop. The button with the circular arrow and checkbox will provide a history of recently viewed stops, including across multiple agencies. The star will provide a list of bookmarked stops, if any. Inside of the History and Bookmarks screens, there will be a trashcan button that will empty out the history/bookmarks. Each entry can be clicked on to immediately load a prediction. The Prediction screen will show the current arrival estimates for the selected stop. The top will indicate the Agency, Route and Stop currently shown. Each individual prediction will indicate the destination/direction of the vehicle. The star to the right of this text will toggle it as a bookmark. Clicking on a prediction will expand it to show the vehicle id. At the bottom of the screen, a message window may be present to show any current broadcast messages from the transit agency. To report any bugs, please send a coherent description with all relevant information in English to late at tehinterweb.com. 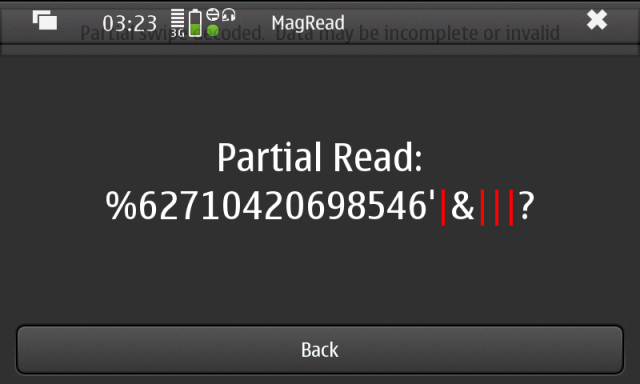 First off, let me start by providing a link to a Symbian^3 binary for MagRead. It can be found here. See the bottom of this post for some more details on this. 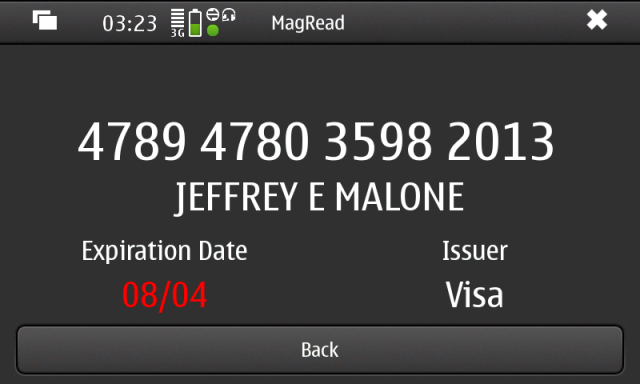 I’ve previously shown screenshots of MagRead running in Maemo on the N900 device. 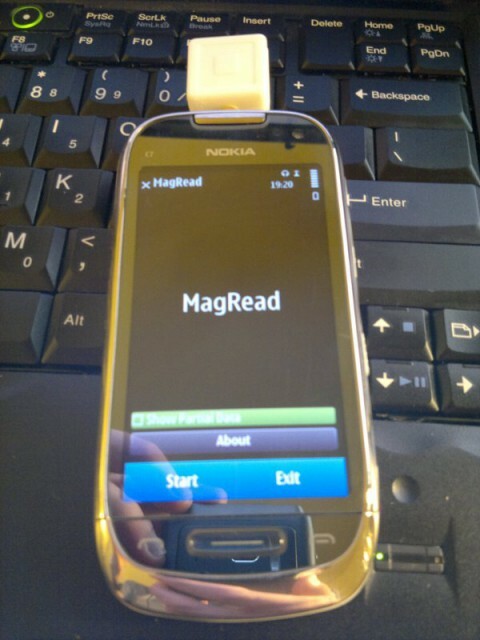 This post will feature some pictures of MagRead on Symbian^3 using a Nokia C7 device. At the bottom is a link to the program for Symbian, so those of you with a dongle can try it yourself. 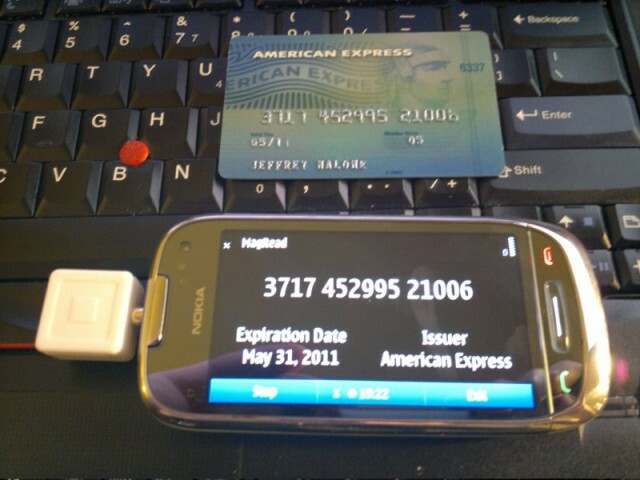 The application has now been tested on the Nokia C7 and Nokia N8 phones. The picture shows the application reoriented into landscape mode, where it changes the layout slightly to better fit the new screen resolution. The red character indicates that a checksum failed there. Any characters to the right of a failed checksum may also be invalid. 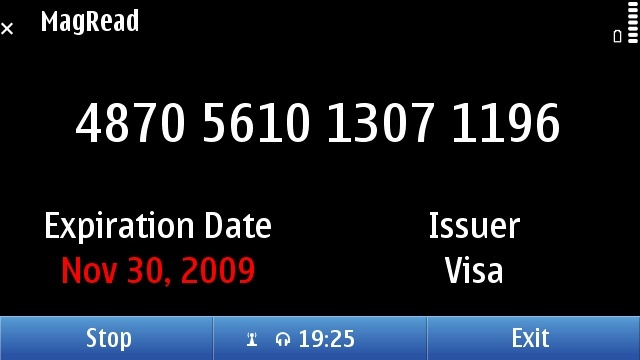 Nonetheless, this swipe shows the complete card number and its expiration date (in YYMM format after the field separator). 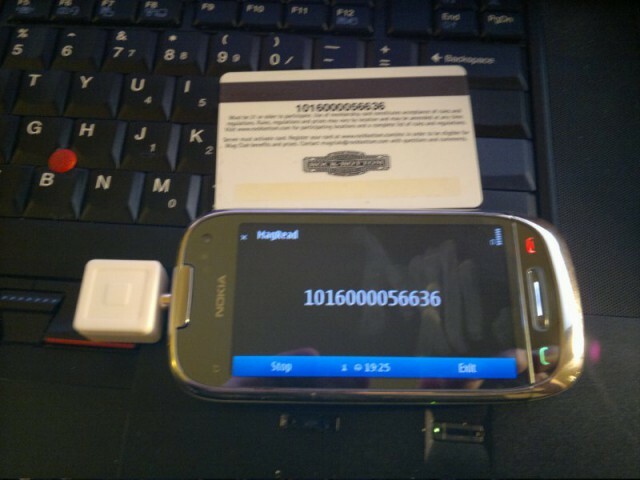 Note that all credit card numbers shown are in fact invalid. The cards are old ones that had been compromised, and the numbers reissued. I am now able to offer a self-signed package for MagRead. It can be found here. The package is version 0.1.3 (or 0.1(3), as shown in Symbian), and is the one demonstrated above. There will be a security warning when installing, noting that it is not from a trusted source. Additionally, you’ll be asked to authorize the application to access the “camera or microphone”. This is required in order to record from the audio dongle (the camera is not touched). Those who don’t wish to trust me can use the Nokia Qt SDK to build the application from source themselves, and verify that what they’re installing does nothing malicious. 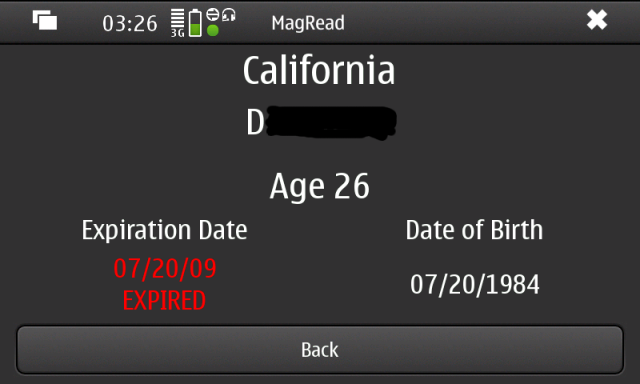 No information read by MagRead is ever saved onto the device or transferred over the network. Once it disappears from the screen, it’s gone. I will not be offering any application that doesn’t follow this principle. As the user base has increased (ie, became existent), I’ve realized that it would be best to give a few usage tips for MagRead. For Maemo 5, you can download the program from extras-testing. It’s entered as “magread”, and the package overview can be found here. The source code for the program, as compiled by Nokia’s Maemo buildhost, can be found from there as well. For Symbian, Windows, OS X and Linux, there are presently no binary packages provided. I intend to provide some later, but at present you need to compile them yourself. The code for the project, along with the bugtracker, is hosted by github. The github project page is here. The program is capable of reading swipes in either direction. However, the success rate of swipes will get even better if you swipe the card in the same direction as the data is written. This would be from right to left, with the card oriented such that the magnetic stripe is on top and facing you. 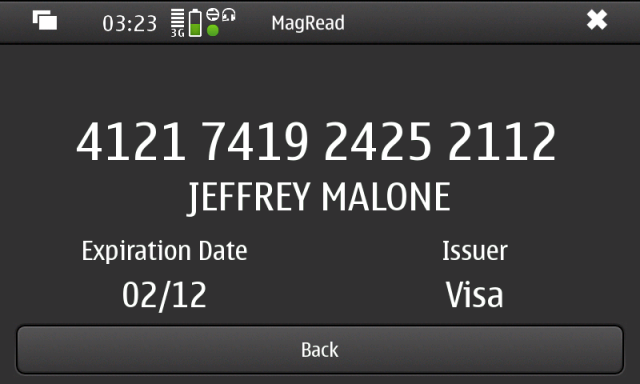 MagRead in no way saves or transfers any information that it records. The open source nature of the program allows anyone to verify this, which I welcome anyone to do. The Square dongle is only compatible with audio jacks wired for headsets. That is, audio jacks that support mono input and stereo output, as found on mobile phones. I’ve run into some Mac Book Pros that have compatible audio jacks, and some Thinkpads. The Square dongle is configured to read track 2 only. For more reference on what this means, see this. The Square dongle can read track 1, however you must offset the card from the read head by an additional 2.79mm (.110in). This can be accomplished by simple adding a wedge into the track. People have also had success in just holding the card slightly off the base while swiping. If you swipe a card, and it doesn’t even give a “bad swipe” error, then the track you’re reading is blank. I’ve experienced this with several store cards, and hotel keys. If it repeatedly gives a bad swipe error, try reversing the direction and varying the speed. It may be damaged, or it may be in an unsupported encoding format. 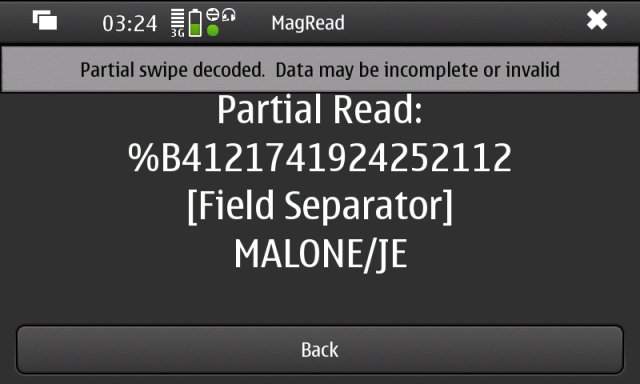 mslib, which provides the decoding support for MagRead, only supports two encoding schemes (ABA and IATA). While they are by far the most common encoding schemes, there may be proprietary ones you come across. In the event you do come across such a card, mslib will still give a valid bit sequence. However, it won’t be able to decode the bits into characters. At present (v1.3-01), MagRead is unable to show you this bit sequence. There is a checkbox on the screen marked “Show Partial Data”. This relaxes the checksum verification to allow for partial reads to be displayed. Any swipe with a known start sentinel will have its data shown, with characters that pass checksum displayed, regardless of whether the LRC is valid. You do not need to stop recording to enable this. You do not need to return to the home screen in order to read another card. The application will continue listening for card swipes until you press the “Stop” button. I’ll add more tips to this page as questions are asked of me, or as they come to mind. There are features presently in the git repository that are not in Maemo’s extras-testing package (v1.3-01). When I push out the updated version in the near future, I’ll be updating this page to reflect the new features (most of which are custom settings configuration). Feel free to ask me questions via the comments section, email, IRC or other means. After a number of posts describing how to decode audio streams of magnetic stripes to bits and then characters, I now present a C library that does all that. The creatively named “mslib” can take a signed 16bit little endian PCM stream of a magnetic stripe and decode it. My own usage tests have been with 48khz, but it should allow higher frequencies and slightly lower ones. When changing the frequency from 48khz, it may be required to alter the “peakOffset” and “peakThreshold” values using the functions defined and documented in mslib.h. Create the mslib object and load the PCM stream as a signed array of short integers using ms_create(). Create a list of peaks, used for decoding the stream to bits, using ms_peaks_find(). Filter the list of peaks for duplicates using ms_peaks_filter(). Decode the peaks to bits using ms_decode_peaks(). The bits as written on the card may now be fetched as a NULL terminated char array with ms_get_bitStream(). Decode the bits to characters using ms_decode_bits(). The characters as written on the card may now be fetched as a NULL terminated char array with ms_get_charStream(). 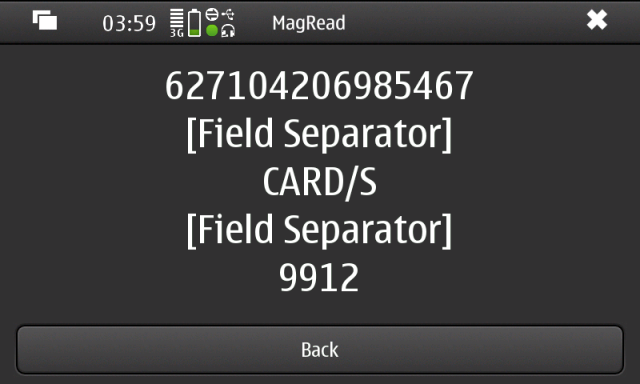 The library can successfully decode any magnetic stripe to bits (subject to a clean audio signal). It will decode the bits to characters for streams encoded using the ABA and IATA encoding schemes as found on almost all magnetic stripes. Development is still continuing, with a top TODO item of removing the glib dependency [Edit: glib has been removed in current builds]. Bug reports, comments and feature requests are welcome and can be left on github’s site. wamu-bad.pcm – An example of a bad swipe of the Visa debit card. 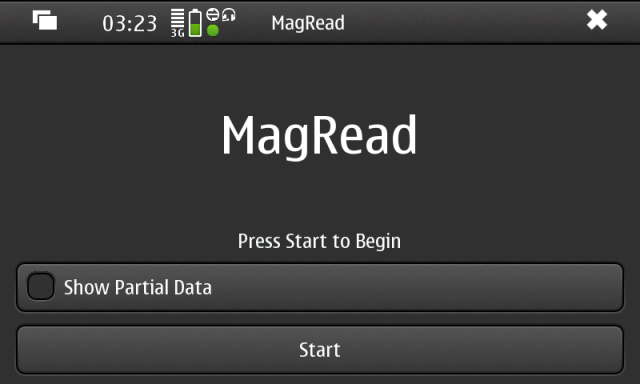 MagRead is a Qt based GUI application originally written for Maemo 5. The application is designed to read all types of magnetic stripes that follow the ABA or IATA encoding schemes. In addition, it attempts to format the data from cards it recognises. At present, credit cards and identification cards are the only cards that will display with their data formatted. Cards in compliance with AAMVA standards will also be recognised. These are identification cards and driver licence cards issued by any government based in North America (approx. 22 US states/territories, several Canadian provinces and at least one Mexican state). Expired cards will put their expiration date in red, and include the word in caps “EXPIRED” underneath. Additionally, if the person’s age is under 18, it will appear in red. Those over 18 but under 21 will have their age appear in yellow. On the home screen, there is a “Show Partial Data” checkbox. 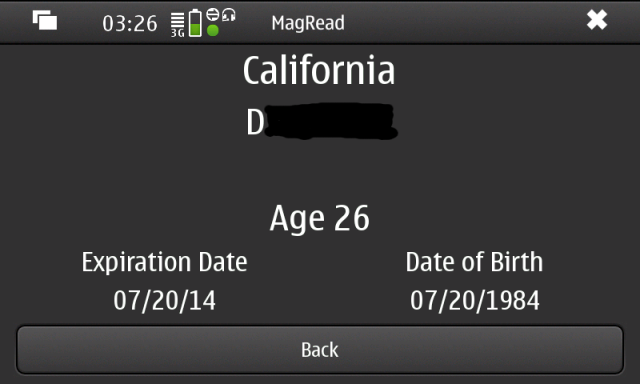 When checked, MagRead will display data read off of cards that my contain errors or be incomplete. By default, only swipes that have passed several parity checks are displayed. 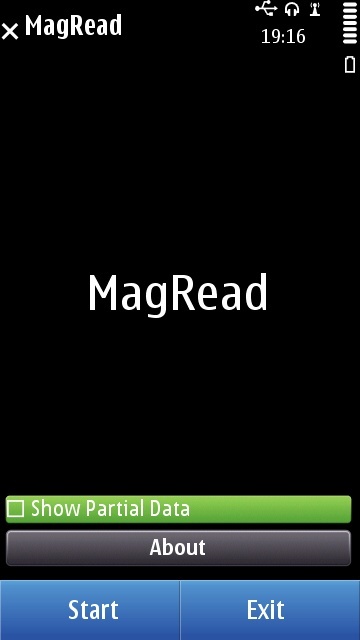 MagRead is still in active development, but will be available for download shortly. It will be released under the GPL. At present, it is written in C and C++ and designed to run on the Nokia N900 with Maemo 5 only. Work is currently in progress to port the application to standard Qt 4.6, and it may be usable on Symbian devices with Qt support. This post coves the encoding scheme defined by the IATA, originally for use in the airline industry. This is the encoding found on airline boarding passes, in fact. It is commonly found on track 1 of magnetic stripes, and track 3 on some cards. Unlike the ABA encoding, this is alphanumeric. ﻿Each character is 7 bits in length. Six bits for the character itself and one odd parity bit. The character set includes 64 symbols, ranging from 0x20 – 0x5f on the ASCII table. Encoded characters are offset from ASCII by 32. E.g., the number 0 is stored as 16 decimal. Adding 32 gives us 48, the ASCII character 0. Values are encoded in Least Significant Bit (LSB) order. The encoding follows most of the ABA encoding scheme, but with a larger character set and different ASCII offset. Calculating the LRC and parity bits however is identical, and the same code can actually be used to decode both ABA and IATA. Always starts with a percent sign, the start sentinel. Always ends with a question mark, the end sentinel. The field separator is a caret (^). This typically separates the account number from the name, and the name from the expiration date. A 7bit Longitudinal Redundancy Check character follows the end sentinel. Like ABA encoding, it uses an even parity bit. The 7th bit is a odd parity bit of the first 6 bits, just like a normal encoded character. On track 1, can hold up to 79 characters. On track 3, it can hold up to 101 characters. For information on how to calculate the LRC, follow the instructions in the ABA encoding post. The Primary Account Number (PAN), up to 19 characters in length. Name of account holder. Format is “SURNAME/GIVEN NAME M” (middle initial). Supports up to 26 characters. Cards vary on how they truncate, some eliminating the / used to separate surname from given. Not all cards will have a middle initial. Additional data up the remaining space left on the track. Not all cards follow this format, and some even use a different field separator. This post will cover the encoding scheme defined by the ABA for magnetic stripe cards. This format is the de facto standard for track 2 of magnetic stripe cards. Each character is five bits in length. Four bits for the character itself, and an odd parity bit. The character set includes 16 ASCII symbols, ranging from 0x30 – 0x3f on the ASCII table. These are numerical digits 0-9 and the characters : ; < = > ? Encoded characters are offset from ASCII by decimal 48 (thus, the numeric digit 0 is stored as 0, and a value of 48 must be added to get the ASCII character 0). Values are stored in binary in Least Significant Bit (LSB) order. E.g., the number 4 is stored as 001 and not 100. I’ll go over a few quick examples of this. The start sentinel is the semi-colon character. This is ASCII value 59, but we subtract 48 from this. We then have decimal 11, and in LSB binary: 1101. We then apply the parity bit to the end, which is 0 here as there is an odd number of 1s. Thus, the encoded character is 11010. Another example, the number 5. This is ASCII 53, but becomes the number 5 once 48 is subtracted. In LSB binary, it is 1010. There is an even number of 1s, so the parity bit is 1. The encoded character is 10101. Always starts with a semi-colon, the “start sentinel”, to indicate beginning of data. Always ends with a question mark, the “end sentinel”, to indicate end of data. 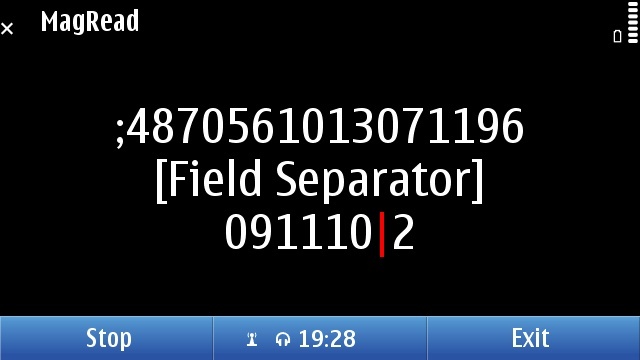 The equal sign is used as a field separator. Traditionally this is put between an account number an expiration date. Some cards will contain no field separators, others may contain multiple. Only numeric digits should be used to store data — the remaining characters, : < >, are for hardware control purposes. A 5 bit Longitudinal Redundancy Check (LRC) character always follows the end sentinel. It uses an even parity bit scheme, as opposed to the odd parity used for characters. Its fifth bit is an odd parity of the other 4 bits, and not an LRC parity bit. A total of 40 characters can be stored, including start/end sentinels and field separators. The LRC is calculated by looking at all the other encoded characters on the card and calculating an even parity bit. Primary Account Number (PAN). Up to 19 digits in length. Overflow can be stored in the custom data section. Custom data. Length is up to the remaining space. This format is found on many cards, such as credit cards. 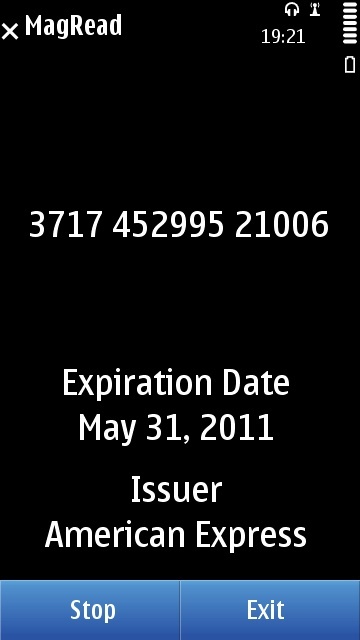 Odds are if you have a magnetic stripe card with an identification number and expiration date, it follows this pattern. Not all cards will follow this, refer to the data formatting section above for some rules that should be consistently followed. 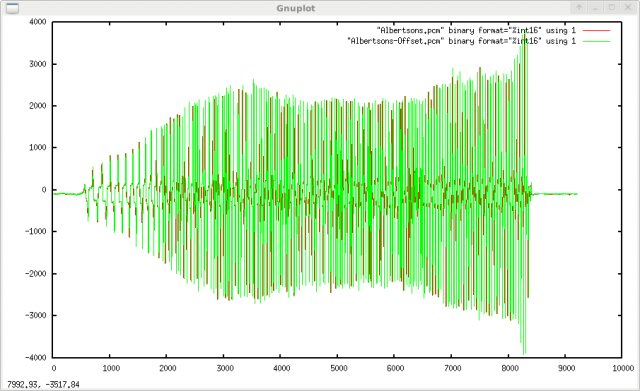 A method to decode magnetic stripes stored as PCM audio data. This post is going to cover the method I use for decoding magnetic stripe waveforms recorded using an audio interface. And many other websites which can be found by Google. First off, an overview of what we’re working with. I am using raw PCM audio files in the format S16 LE at 48KHz. I’ve worked with 441.KHz streams reliably, and easily scaled up to 192KHz — overall, 48KHz seems optimal. A card swipe at 48KHz generally consist of about 10k samples, and are roughly 20kb. The data on the card is represented using amplitude peaks of alternating polarity. Find the location of each peak in the stream. 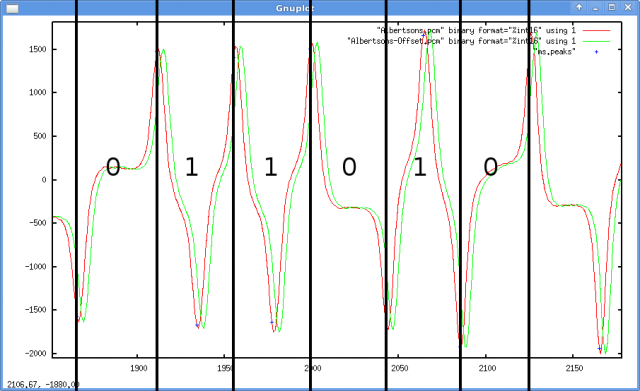 Decode the frequency of the peaks to output 0s and 1s. In this example, with an amplitude threshold of 750, we have consistently found two intersects per peak. It is also possible to have situations where the little hump before the actual peak results in several intersects — all of these can be filtered out very simply. 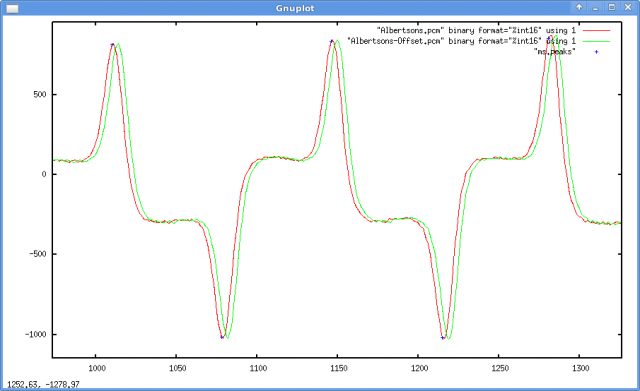 The filtering process I apply is to group the intersects detected by amplitude polarity. 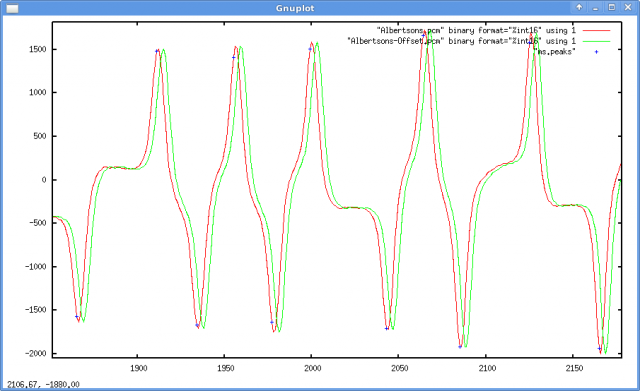 For instance, in the above picture, the first positive amplitude two blue crosses around sample 1010 would be a group. The second group would be the two negative amplitude crosses around sample 1075, and so forth. Once I have a group, I can pick the highest absolute value of amplitude, and reliably assume this is the true peak. I can then move on to the second step, which is to use the frequency of the peaks to decode the stored bits. Beginning and end of stream are padded with 0s. Stream is self-clocking. The padding 0s tell you the clock speed, and you adjust the clock speed as needed while traversing the stream. A zero bit occurs when the distance between peaks is a full cycle. A one bit appears when there are two peaks in the full cycle. Going through the list of peaks and determining the difference between them produces a valid bitstream. As the stream progresses, the clockspeed will reduce significantly, generally starting around 90 samples and reducing to as few as 10 to 15 samples. Since it happens gradually, you can recalculate your clockspeed after every cycle. An Albertsons Supermarket card was used as the example data on this post. The PCM file used may be downloaded here.